ShapeLogic is an open source toolkit for declarative programming, image processing and computer vision. ShapeLogic has 2 applications: The Color Particle Analyzer will find and categorize particles on a relatively uniform background then make a report of geometric properties for each of the particles. 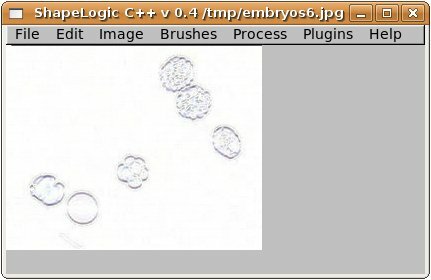 The main application is for recognizing cells in medical image processing. The Letter Matcher is a general categorizer for skeletonized lines. ShapeLogic is a library for lazy streams, works a little like LINQ, but for Java. Code hosted on http://code.google.com/p/shapelogic/. From there you can download both source files and binary distributions. Join the ShapeLogic mailing list for announcements, questions, bug reports, suggestions and feature requests. You can help improving the stability of ShapeLogic by filing a bug report. The first ShapeLogic implementation is in Java. ShapeLogic C++ was started in September 2008. Started in ShapeLogic 1.5 the categorization in the Color Particle Analyzer and the Letter Matcher, can either be done with handwritten rules or generated by machine learning. The first machine learning technique in ShapeLogic is a multi-layer feed forward neural network that is trained externally but run internally. While ShapeLogic's declarative programming system was initially developed for image processing and computer vision, it is widely applicable. It is currently difficult to combine declarative programming and image processing. ShapeLogic is intended as basic plumbing software that turns a logic engine or a neural network into a simple plugin component to ease entry into vision and image analysis. ShapeLogic also fills gaps missing from current Java image processing libraries, and uses a commercially friendly license. Contains a framework for declarative and functional programming. Image processing algorithms now work both in ImageJ and on Java's BufferedImage. 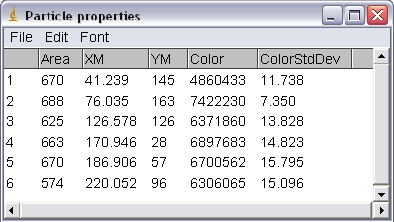 ShapeLogic 1.6 contains a Color Particle Analyzer. Here is the result of running the non-customized particle analyzer on it. The categories for the particles are only examples, it is easy to setup different rules for categorizing particles. In ShapeLogic 1.7 train a neural network to categorize specific cells. ShapeLogic 1.6 also contains the second version of a color particle counter. It also prints a smaller report of the particle's properties. To run as a library for functional and declarative programming there are no requirements. You can run all current image processing algorithms outside ImageJ, using just a BufferedImage should you want to embed ShapeLogic in your application. ShapeLogic is in Beta, as of version 1.0. ShapeLogic currently consists of 37,000 lines of Java code including 600 unit tests. ShapeLogic C++ started as an attempt to port some algorithms from ShapeLogic Java. ImageJ makes image processing programming very accessible under Java. While there are great open source libraries in C++ there did not appear to be anything like ImageJ with an commercially friendly OSS license. Before algorithms could be ported from ShapeLogic Java some of the functionality of ImageJ had to be established. Simplicity of programming is a main concern. The neural network need to be trained externally and you need override a class to import the weights. This override is simple but does require some knowledge of Java. Add the ability of the user to define lazy data stream in the categorizer setup file. The rule sets and neural networks that are now defined in categorizer setup file could just as well be defined in a database. 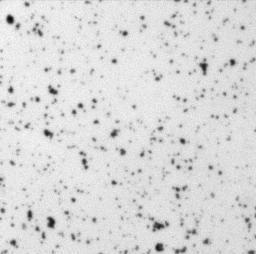 Here are 2 other test image for the particle analyzer. 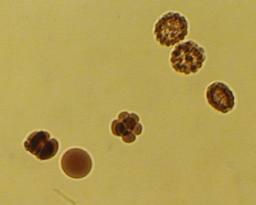 They are taken from the sample images from ImageJ. Mathematical problems from Project Euler. This is a list of 193 mathematical problems that can be solved by computers. They vary in complexity from simple to hard. The goal is to test ShapeLogic's new declarative and functional constructs on real problems and make sure they are terse and intuitive.